It’s 3:37 pm and I am just stepping off of the train. I finally had a chance to catch up on some reading. It was silly of me to think that I would actually have time to breathe let alone read or write. I have forced myself to keep up the writing–any down time I have has been devoted to it. I throw the heavier pack on to my back, adjust the waist straps, pull the shoulder straps and buckle it all up. The amount of times I’ve done this has made it automatic. It’s almost second nature to me and it’s only day four. It’s hard to believe less than a week ago I was in the states living comfortably and now I am half way across the world living out of a backpack traveling hundreds of miles per week. The more I think about what I’m doing the deeper my thoughts go. I essentially gave up a good paying job and a cheap apartment to travel the world for a few months and live out of a backpack. Perspective is an interesting thing. Everything can be seen from a kinetoscope of angles. Truthfully life is all about illusions. I mean that in the best possible sense. For example, first impressions. There is no bigger illusion in existence than a first impression. Not only do we pretend to be better than we how naturally act, our entire goal is to give the person we a meeting a better impression of who we are. Illusion by definition is deceptive appearance or impression. Now with that same first impression we can either create a better illusion of self or a worse. It’s all about what personality we decide to show. I mean hell, I can meet someone and create a whole new identity for myself. Naturally I am a fairly outgoing person, but if I wanted to I could pretend to be timid and shy, or even over-confident and jocky, and the person I am meeting would never know the difference. They would assume, rightfully, that is who I am. It’s all about what characteristics we choose to unveil (for our illusion). Now add traveling half way across the globe and it’s in a sense, magical. I am traveling not only to see what this world is really made up of, but to find out what I am made up of. I am a strong believer of what have you done over what you have learned. Traveling give you the opportunity to really find yourself, especially when you are doing it solo. I had the option to travel by planes, which are extremely cheap out here. (I paid $35 to fly from Dublin to London) But I chose land transportation for two reasons. It is cheaper, and slower. It seems strange to want to travel slowly, but it isn’t. By taking my time, I can see more, think more and understand more–about both myself and my surroundings. I think one of my favorite reason life is just an illusion is that no two people ever see the same thing. Obviously everyone doesn’t see something vastly different but we can never actually share the same experience. Everything we see is based on of our past experiences. When I say see, I don’t mean solely our use of sight, it’s a more complex than that. What I mean is what catches our eyes. What sparks a thought. What reminds us of a feeling or place we once were. captivating us. I think that’s really the reason I am so open-minded. I understand that everyone has their own stories. This story is what lead them to believe what they do. Who am I to judge someone else’s life? They were the only one there for it. People are always so quick to judge someone else’s life forgetting that no one knows the answers. It’s just educated, or in some cases uneducated guessing. Luckily the people I have met have very much the same mentality. We are all just passing by in each others life. This is exactly why I talk to as many people as I can. Luckily the hostel I am staying in is only about a mile away. I was smart enough to download maps for every city I go to. I don’t trust my sense of direction just yet. It’s about a 20 minute walk of exploring the town before I found my way to the hostel. It was just on the outskirts of town which seemed surprisingly dead. I mean it was midday on Sunday but in less than 6 hours tens of thousands of people would be 10 miles away. The walk up to the hostel was strangely enchanting. There was a snake-like path leading up to what I hoped would be the hostel. This path though was covered from floor to sky in trees, plants, and green growth. It almost felt as if I was walking into a man-made entrance of rain forest. 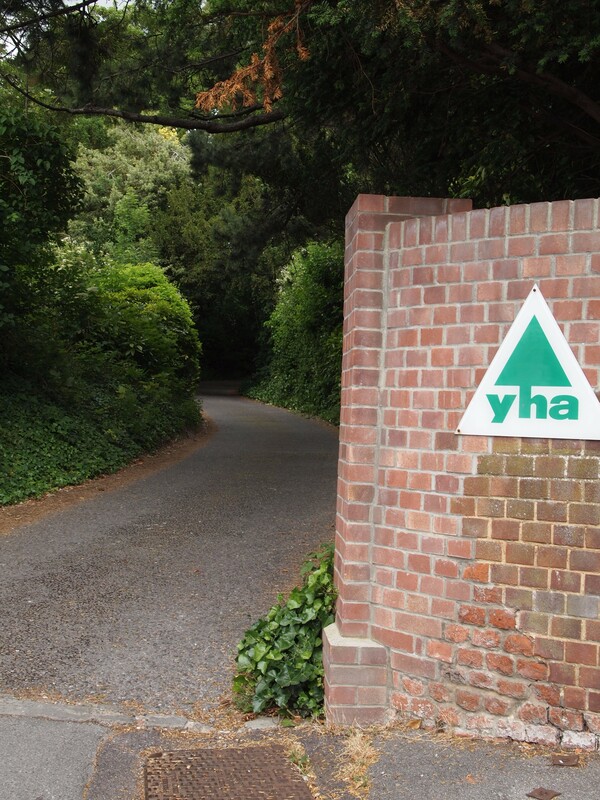 As I round the bend I see the hostel. I am slightly taken back by it. 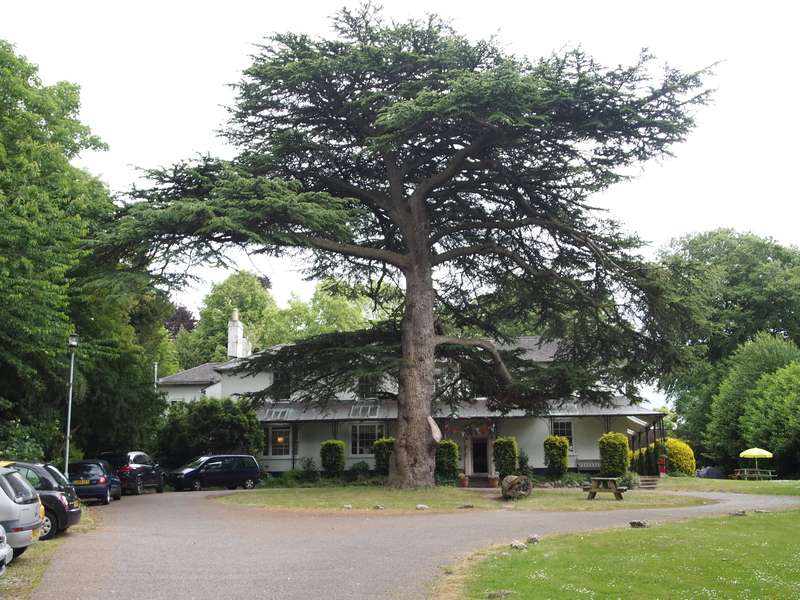 There is this massive enchanting tree placed right in front of it. It feel entirely out of place compared to its surroundings but gives the idea that everything here was built around it. I reach the check in counter and wait for eye contact. I always feel like I am interrupting them, but then again this is their job. Before I know it I have the keys and I head back to my room. There are two separate sections, the rooms that are within the house, and the rooms that are behind the house in a separate trailer like building. I struggle with finding the right key but eventually make my way in and to my room. For the first time I am in a room with only a few people. There are three bunks so that means 6 people. I catch myself and begin to laugh. I am about to sleep in a room with 5 strangers and I consider that to be both normal and a small group. It’s about half past four by the time I get completely settled in my room. I was told at the front desk a bunch of things but he stressed two things to me. Firstly, that I should leave around 9 pm to head to Stonehenge. Anything earlier would be too long of a night, the sun wasn’t set to rise till a little before 5 am. Secondly I was to be out of the room by 10 am. He warned me that alarms would set off at exactly 10 am to make sure everyone was up and heading to check out. I put my most important stuff into a locker and crawl into my bunk. I figured a few hours of rest would be enough to carry me through the night. I wake up after about 3 hours making it almost 8 pm. My stomach is growling and I realize that I have yet to eat today. I grab everything that I will need for the night and head out toward the town. 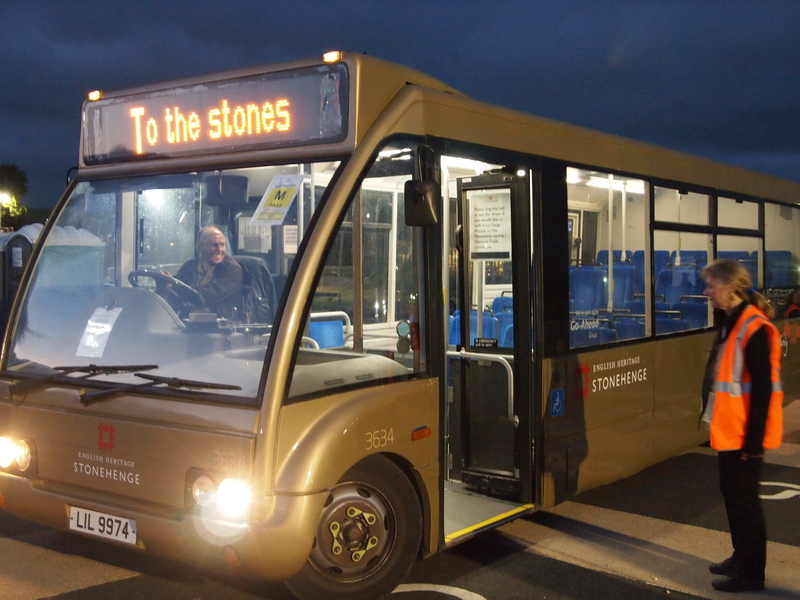 The bus stop for Stonehenge is about two-thirds of the way to the train station. I walk around aimlessly attempting to find something cheap and filling. One of the first places I see is a chinese food restaurant. That caught me off guard. 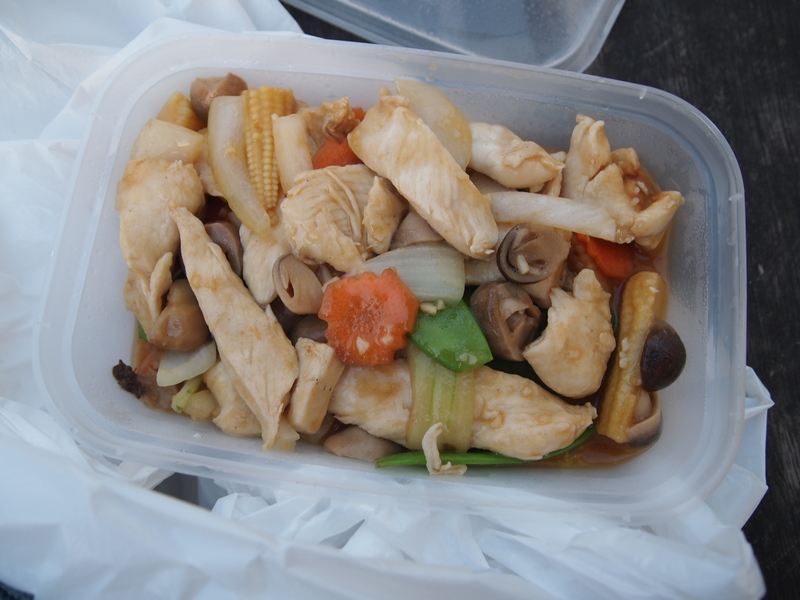 For some reason my brain was taken back by the fact that in England they also like greasy delicious chinese food. I stop by excited to get either boneless spare ribs or chicken and broccoli. I should have guessed. A menu that made absolutely no sense to me. This is not the American Chinese food that I had expected. I stare the words trying to make sense of what it could possible be. Chinese food is vague enough as it is so I really had no idea what it was hidden behind these words. I finally pick something that sounded good. Fried chicken with a lemon garlic sauce and mixed vegetables. I walk around the town trying to find a nice spot to sit and eat. Eventually I come across a bench and decide it would be good enough. I open up the bag, pull out the container and stare at what I had ordered. No idea what it was, certainly wasn’t what I expected but it did look and smell tasty. I grab my fork and take my time to think about where it should land. I see a piece of chicken screaming to be eaten. I take my fork and dive in straight for it. Just as I pierce through the chicken I hear a snap. My fork, before the first bite had broken in half. Wonderful. Now I have this strange hobbit fork to eat chinese food on a bench somewhere on the outskirts of England. Even with the Lord of the Rings featured fork I was able to eat everything. It was just greasy enough to hit the spot. It time for me to find this bus station. As I come across what seemed to be the bus stop the bus rolls up from behind me. I’ve seen these busses all over London and knew exactly where to look to see what direction it’s headed. TO STONE it reads in large yellow letters. Perfect. I hope about pay the fare and rush up the stairs to second level. You can always get the best views from the top. As I climb up the stairs I look to my right and see the front row entirely empty. Perfect. These double-decker busses have one of the largest windows I have ever seen. 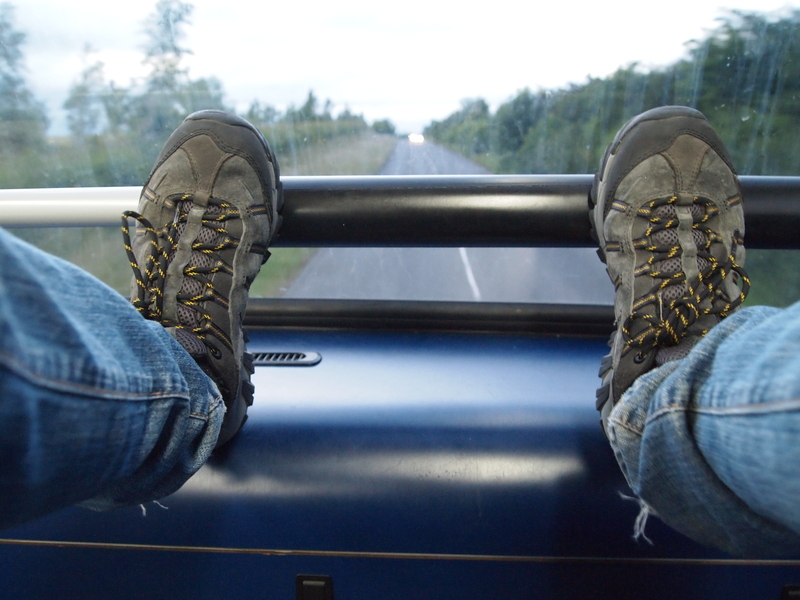 It gives you a panoramic view at the front of each bus. Forgetting how easily chinese food can put you into a coma I start to get a little tired. The bus fills up and slowly heads out. 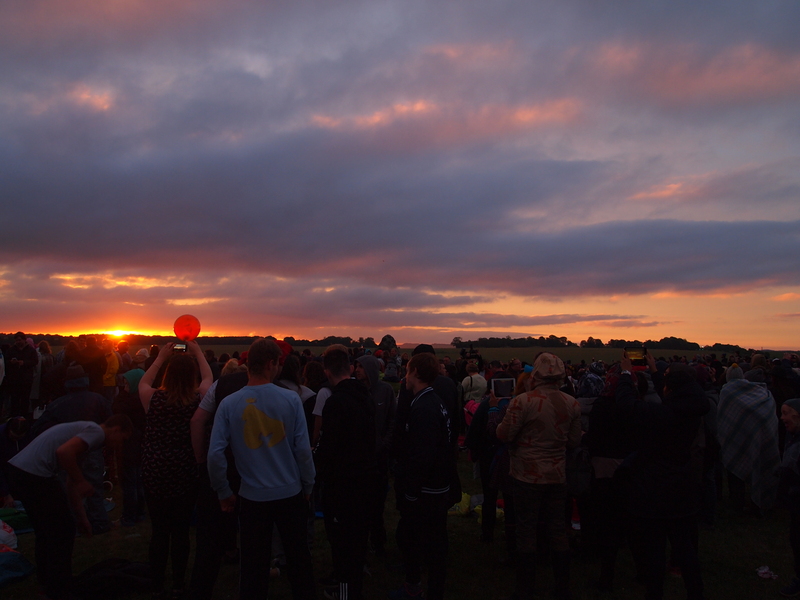 Everyone here is about to witness the summer solstice. What I assumed would be a lax bus ride was completely wrong. To my left were two American girls complaining about the woes of traveling and at the back of the bus were about 20 drunk brits singing and chanting songs. There is something about drunk bar chants that really crack me up. I personally think they are one of the most fun things to do when drinking. Although I didn’t bring anything to drink, it as just as entertaining listening to them. Throughout the 45 minute bus ride I overheard a lot of conversations. One was between two guys who seemed to be from the states. On more than one occasion I heard American cities. Normally I jump on an opportunity to ask where they are from but my brain is still lagging in a chinese time zone. As we leave the bus and follow the crowd towards Stonehenge I actually ended up walking beside them. Next thing I know we’re having conversations joking and excited for the night. Alex as I had expected was from the states, Washington DC to be exact, while Travis was from New Zealand. Both of them have been traveling around for the last few weeks but they just met each other at the hostel. It’s a decent walk from where the bus dropped us off and where Stonehenge actually was. The sun had set so we were just following crowds of people toward what looked like lights. Eventually we make our way to the crowds and got our first glance at the 4,000 year old structure. One of the most interesting thing about Stonehenge is that they are not even sure why it was built. A theory is that it was made as a monument for the unification of what will later be known as Britain. It explains why different types of stones from all over the region hundreds of miles away appeared here. 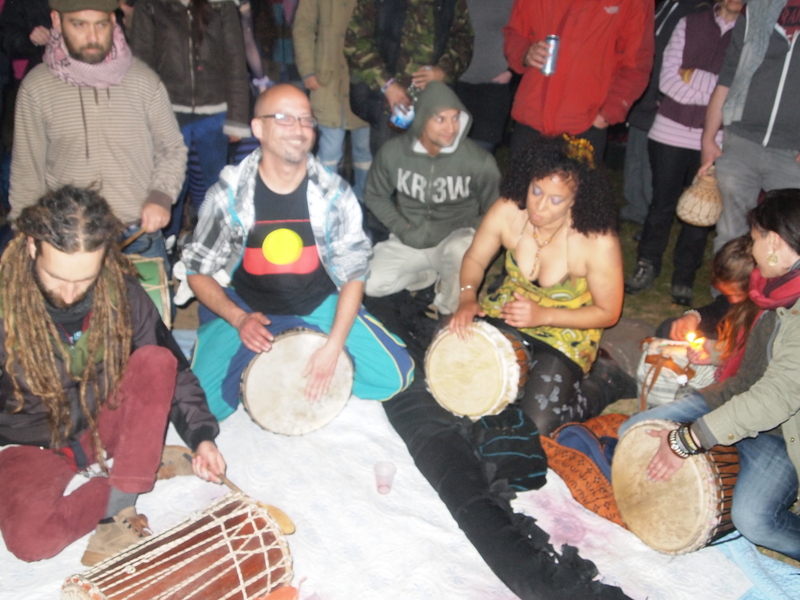 It was meant to bring people of different backgrounds and allowed them to work together and celebrate. Surrounded by the stones is hundreds of people. It was almost like an out-door concert where people brought their own sheets to lay on and food to eat. 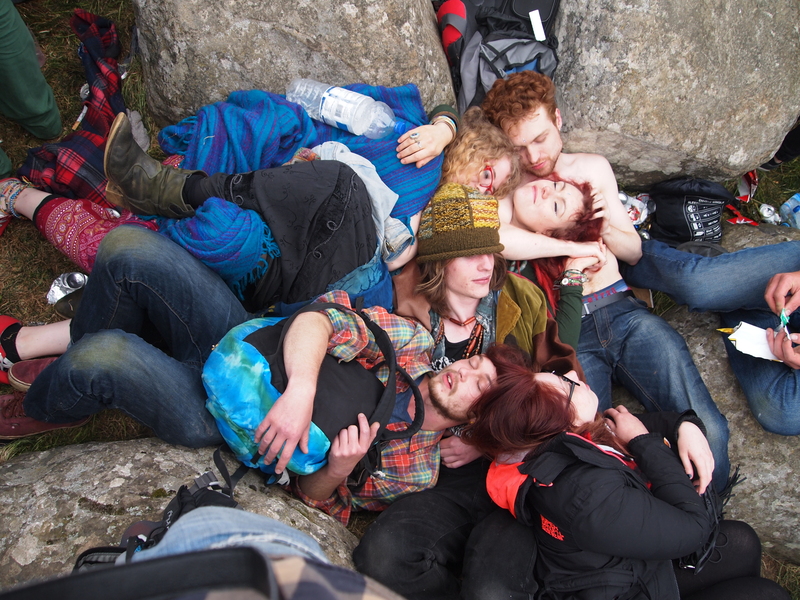 We had to zigzag through groups of people and make our way to the stones. It was hard to grasp the fact that I was staring at Stonehenge. Not that this it had any meaning to me beforehand. But the fact that I was here staring at a site that I had seen in photographs hundreds of times was surreal. 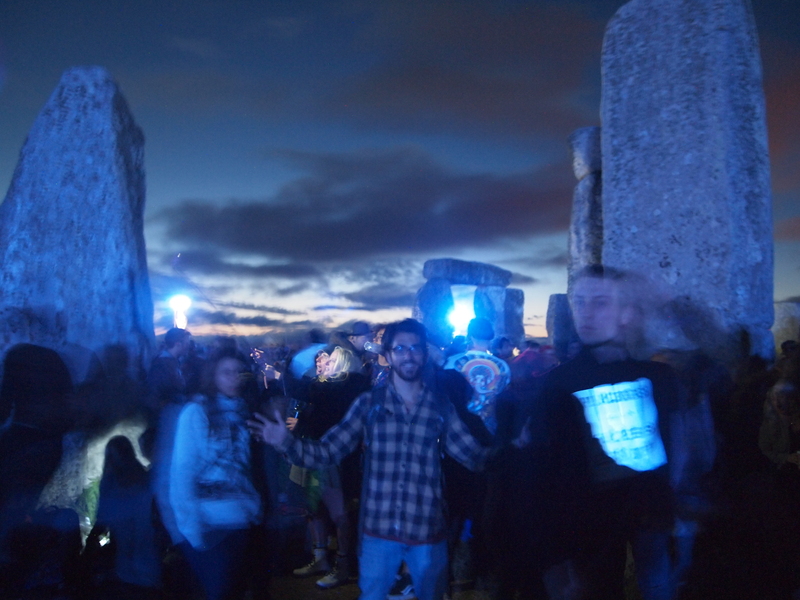 We spent the next hour walking through the crowds, touching the stones and photographing what we could. It felt like there was so much to see and do although Stonehenge itself isn’t that large. Travis knew a lot about the Stonehenge so whenever he came across something he recognized, he filled us in on it. Eventually he lead us to the Heel Stone. Nobody’s really sure what this stone is used for but it is assumed it was used as a marking point for the sunrise. We decide that it would be a good place to relax. We put our bags down and sat alongside them. Alex was more than prepared with a water bottles filled with wine, vodka tonic, and rolling tobacco . Although I didn’t plan on drinking, I certainly wasn’t against it. I mean what kind of person would turn that a gift from someone, I’m no monster! Over the next few hours we drank and relaxed under the stars. We talked a little bit about who we are and what we are doing but most of the conversations stayed pretty abstract. I decide to prop up my backpack as a pillow and look up at the stars. This was hands down the best decision I could have made. Right above the Heel Stone was an endless amount of stars. I think one of the biggest downfalls for me of living in the city is the lack of stars. On any given night where I grew up I was able to see stars. Between the cities light pollution and air pollution you’d be lucky to see even one. I really can look at the stars and feel relaxed. There is something about the size of it that reminds me of how small my problems a really are in grand scheme of things. My first reaction was to see if I can recognize any consolations. Within minutes I was able to find the big dipper and the north star just over the stone. I couldn’t help but get excited. 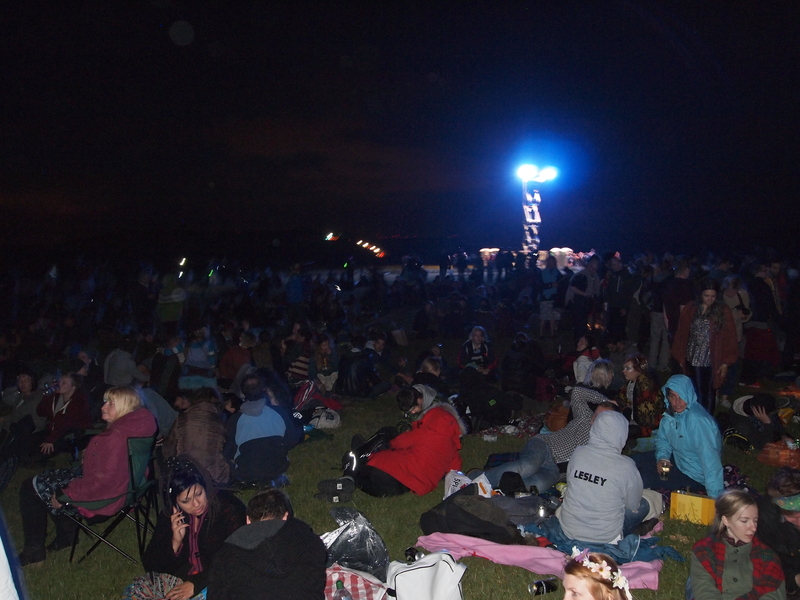 Not only was I witnessing a perfect starry night, there as nothing but laughter happiness and music surrounding me. About 30 yards behind us was a group of people playing anything and everything you can imagine. 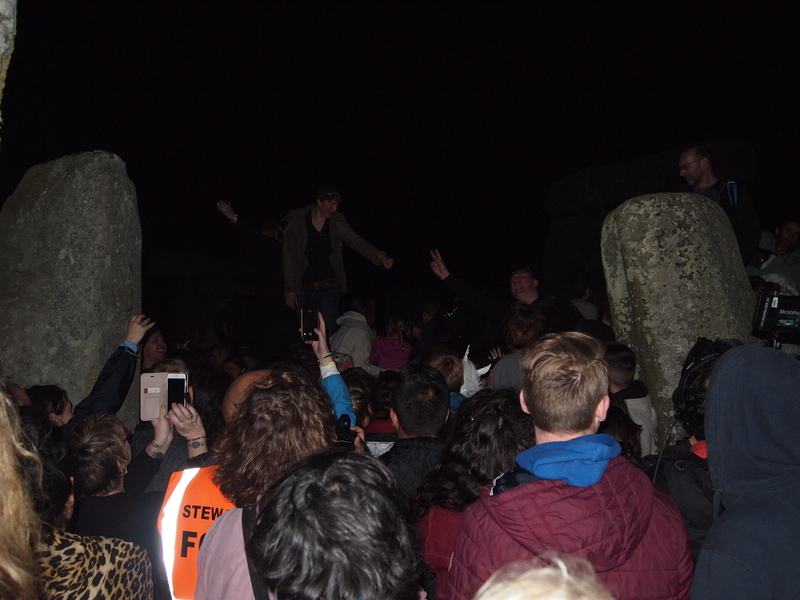 The thing about Stonehenge is that no amplification devices are allowed. So the only instruments people can have is natural sound instruments. This meant anything from acoustic strings, percussion or wind instruments. It was the one of the best performances I had seen and no one here is a professional. Everyone just gathered together to play some music. The best way to describe what the music sounded like is if you close your eyes and picture what tribal music sounded like thousands of years ago. This was more than likely the same style of music that influenced the building of Stonehenge. It felt like I was taking a step into the past and I loved it. I oversaw a group of girls attempting to take a picture of themselves. Alex and I jumped over to help them. 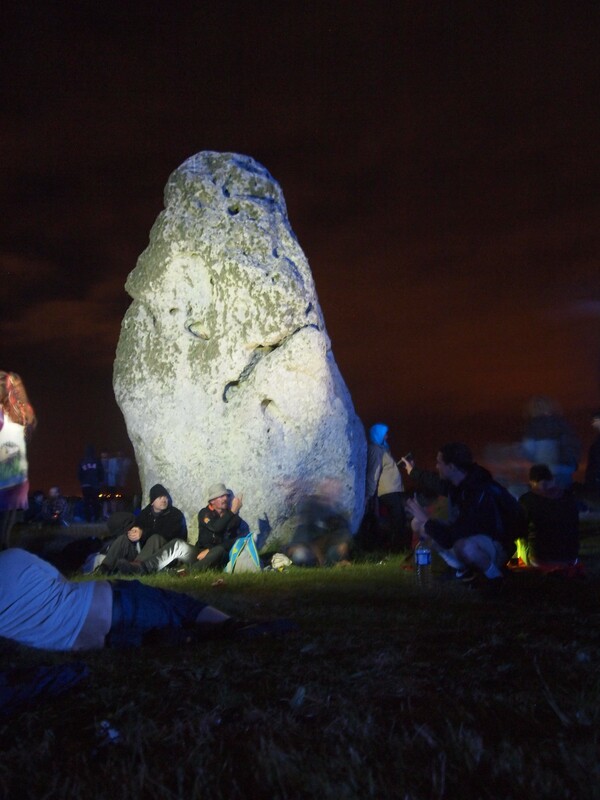 Given that Stonehenge is a religious ceremony for Druids a lot of people like to dress up in order to honor them. These girls were dressed the part. They looked like they were dressed for the queens ball and certainly caught my eye. After taking the pictures were taken Alex headed back but I sat there and talked with them. They were all from England and this was their 3rd time seeing the summer solstice here. After spending some time talking with them I decided to go back and join Alex and Travis. By this point we were deep into the night but had several more hours before we even saw the sunrise. We decided to explore the center of Stonehenge. This is where the real chaos was. The best way to describe what was going on is to picture a bunch of hippies either drinking, smoking, singing and sometimes all three. By this point I was feeling the wine and I was in a good mood. Confident enough to feel good but sober enough to have a real conversation. Somehow I started talking with this group from somewhere in England. An 19 year old who was just starting what we college, they call university. Her and her friend have been drinking all night celebrating. I think we started talking because she heard my American accent. Either way she is going to school to be a linguist so she is fascinated by words and accents. Ironically enough I am in love with words. I think languages are one of the most interesting things. People all over different ways of describing the same thing and ways of putting feelings into word in a way that some languages simply can’t. We were having a blast making of un the different things each of our countries say. She kept telling my some of the most like, spend a penny, cheeky, posh, piss up, goolies, the list goes on! At some point in our conversation Alex and Travis disappeared and eventually reappeared. After that I said goodbye to my new British friends and ventured off yet again. It was about 3 am and we had only a few more hours till sunrise. You could feel the intensity in the air. 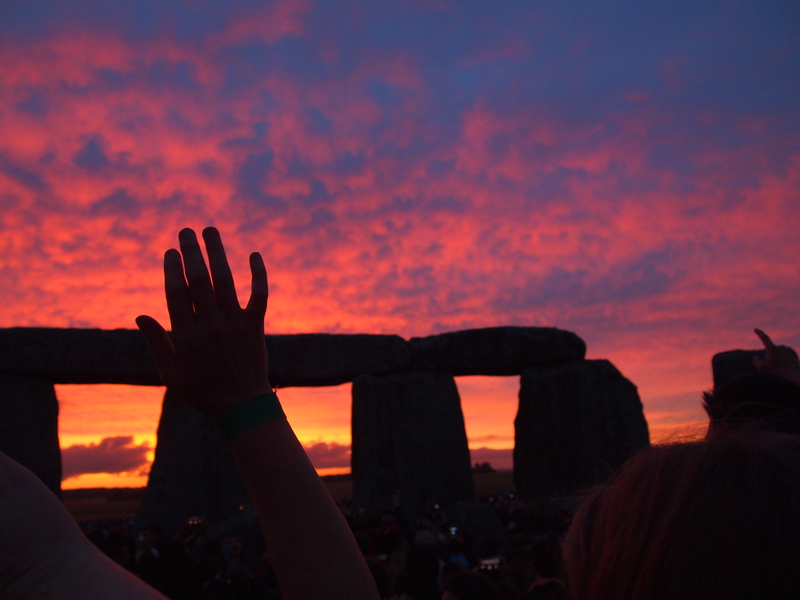 Everyone was just a few hours away from witnessing the birth of summer through Stonehenge. As time got closer we worked our way into the middle to really see the sunrise. I remembered that there was a rock in the middle that would be perfect to stand on. We worked our way through the ocean of individuals. It was like having to navigate through a concert just as the performer finished their last song. Everyone was thinking the exact same thing–let’s got that way. We made it to the stone but of course it was already crowded with people. I figured I’d have to settle seeing it from ground level. As I am attempting to get the best view I can I hear someone yell “Chris!” toward me. Very confused I look around trying to figure out who the hell is calling my name. Alex and Travis are beside me and that is everyone I knew. I heard it again, but this time I looked up. It was the girls we met before taking selfies! She puts her hand out and helps me onto the rock. It turns out that they were the ones taking over the center rock. Perfect! I can’t even begin to describe how perfect this sunrise was. I overheard the girls mention how this was probably going to be the best sunrise they’ve seen yet. The last few years it was cloudy and raining. The weather tonight was supposed to be the same but thankfully the weatherman was wrong, as always. That’s the only job you can be wrong 80% of the time and still be employed. But that was the last of my concerns. The sky slowly turned orange followed by purple and blue. It was really the more captivating colours I had ever seen in the sky. Slowly the summer sun rose and the view was getting better and better. I couldn’t put my phone, eyes or camera down. Every time I thought this was going to be the best it just kept getting better and better. Eventually the moment came. Where the sky was engulfed in color. It was as if I were witness a live water panting appear before my eyes. I decided to stay on the rock for as long as possible. This was one of the two times a year we are actually allowed to be close enough to touch the stones. 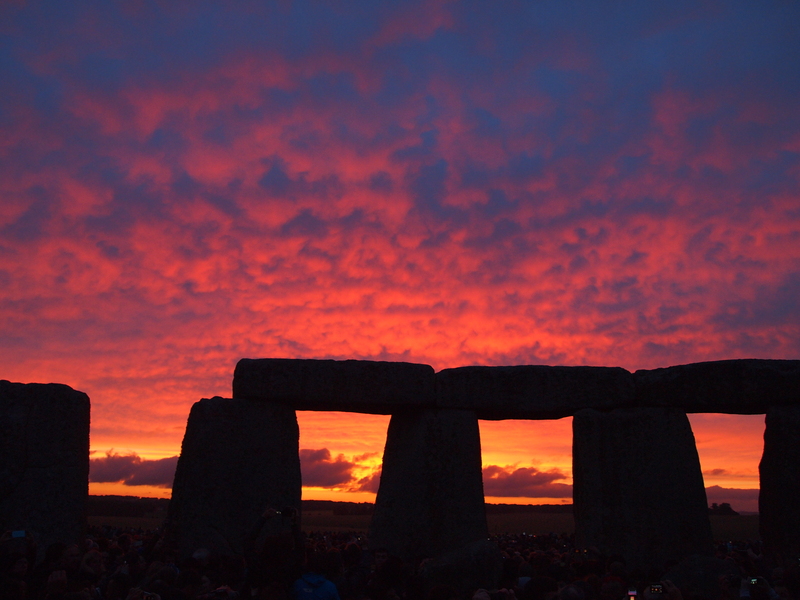 Only during summer and winter solstice is Stonehenge open to the public. I wanted to take in a much of this as I could. I turned my head and a sea of people in every direction. Here I am thousands of miles away, witnessing an event that has been happening for thousands of years, surrounded by thousands of people. These are the moments I will never forget.